Farmington has an efficient transportation infrastructure that provides economic and social opportunities and benefits that result in positive multiplier effects such as better accessibility to markets, employment and additional investments. The City is intersected by United States Highway 67 and Missouri State Highway 32. United States Highway 67 connects to Interstate 55 approximately 30 miles from the City. Interstate 55 provides direct access to the St. Louis Metropolitan Area and U.S. Route 60 to the south. Farmington is located within 8 hours freight distance from many large markets including: Chicago, Memphis, Kansas City, Louisville, Nashville St. Louis, Cincinnati, Birmingham, Indianapolis, and many more. Within 24 hours freight distance all markets from the front range of the Rocky Mountains to the East coast are readily accessible. The City is served by 5 motor freight carriers and Mineral Area College training programs include a commercial truck driving school to ensure a labor pool of skilled operators is available for your needs. 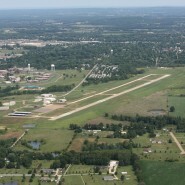 Farmington Regional Airport serves as an air transportation hub for private and corporate aircraft. The airport is currently 4,200 X 50 with a full compliment of navigational aids and a nicely furnished terminal area. Airport services include single point fueling truck capability, self service fuel for 24 hour access, no-cost landing or tie-down fees, two courtesy cars, and a comfortable pilot’s lounge. The City is presently planning capital improvements that include expanding the airport to 5,000 X 100 to accommodate most all corporate and small freight aircraft. Regularly scheduled air passenger and freight service is available at Lambert St. Louis International Airport located approximately 70 miles from the City. Local public transportation is provided within the region by Southeast Missouri Transportation Services for a nominal fee.